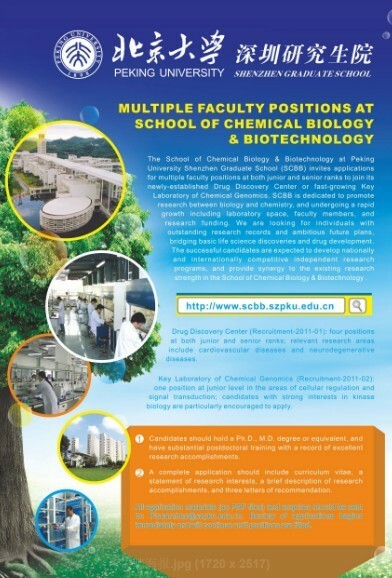 The School of Chemical Biology & Biotechnology at Peking University Shenzhen Graduate School (SCBB) invites applications for multiple faculty positions at both junior and senior ranks to join its newly-established Drug Discovery Center or fast-growing Key Laboratory of Chemical Genomics. SCBB is dedicated to promote research between biology and chemistry, and undergoing a rapid growth including laboratory space, faculty members, and research funding. We are looking for individuals with outstanding research records and ambitious future plans, bridging basic life science discoveries and drug development. The successful candidates are expected to develop nationally and internationally competitive independent research programs, and provide synergy to the existing research strength in the School of Chemical Biology & Biotechnology (http://www.scbb.szpku.edu.cn/). Drug Discovery Center: four positions at both junior and senior ranks; relevant research areas include cardiovascular diseases and neurodegenerative diseases. Key Laboratory of Chemical Genomics: one position at junior level in the areas of cellular regulation and signal transduction; candidates with strong interests in kinase biology are particularly encouraged to apply. Candidates should hold a Ph.D. degree or equivalent, and have substantial postdoctoral training with a record of excellent research accomplishments. A complete application should include curriculum vitae, a statement of research interests, a brief description of research accomplishments, and three letters of recommendation. All application materials (as PDF files) and enquires should be sent to: pisearches@pkusz.edu.cn. Review of applications begins immediately and will continue until positions are filled.